Hello friends and Happy Good Friday! Does any one else toss those leftover pieces of designer paper into a scrap box? I have a box filled with pieces left over from previous projects along with frames and die cuts that never quite made it on the original card. As I was looking through the box, I pulled out a frame and a few matching springy looking yellow pieces, cut them into strips, and started weaving them into a background. Creative Nugget: A distress ink color wash was applied to a piece of mixed media paper which was embossed with a burlap texture plate...this was mostly covered up with the paper weaving. The frame was popped on top of the woven paper strips. 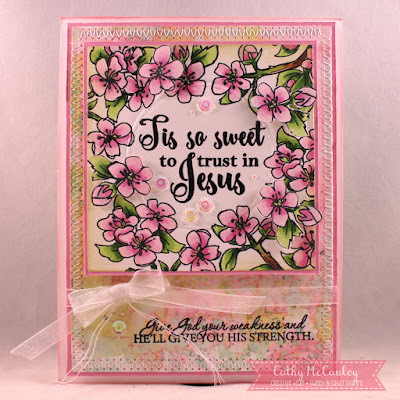 The sentiment is from the Timeless Hymns stamp set released by Sweet 'n Sassy Stamps this month and was white embossed on a black strip. The flowers from Whimsy Bouquet were stamped onto mixed media paper colored with Distress Oxide inks, fussy cut, and popped onto the card. 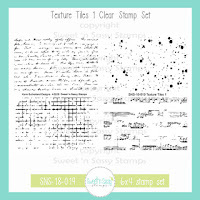 Some texture was added with one of the stamps in the Texture Tiles 1 stamp set. 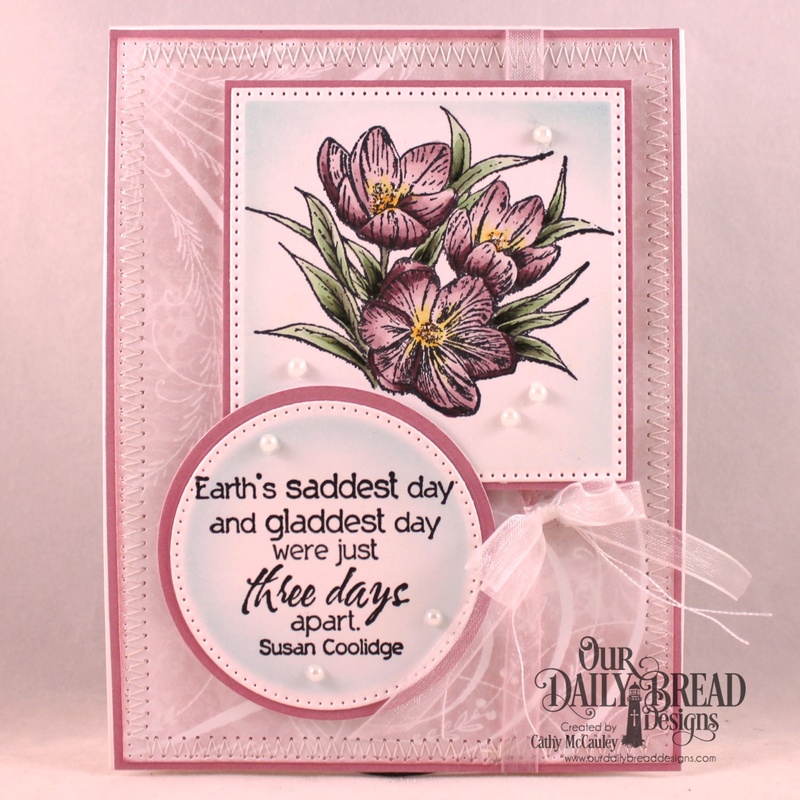 A few enamel dots were applied to the flower centers to finish this scrappy card. Thank you all for stopping by...wishing you a wonderful Easter! Because He lives I can Face Tomorrow! Hello friend! 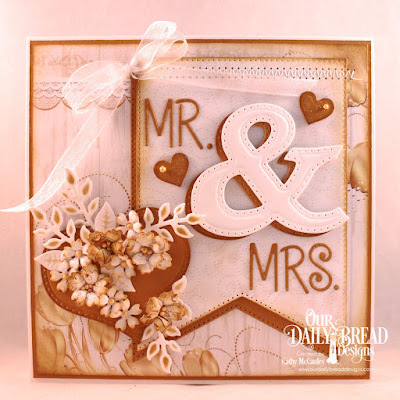 It's time for another Two for Tuesday feature over at the Our Daily Bread Designs Blog. Because Easter is this Sunday, I chose to use the Earth's Gladdest Day stamp set and made a CAS and a stepped-up version of my card. Creative Nugget: The CAS version has a stitched background with papers from the Shabby Rose and Shabby Pastels paper pads. The crocus from the Earth's Gladdest Day stamp set was colored with Copic Markers and the sentiment was clear embossed. The ODBD Custom Dies used to cut the panels include the Pierced Rectangles, Pierced Circles, and Circles dies. A few pearls were added to finish the card. Creative Nugget: An extra panel of paper and a Fancy Circles die cut layer were added for the stepped-up version. Hello friends! 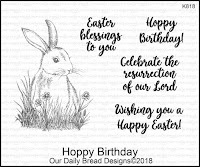 My family will be celebrating my Sister-in-Law's birthday this weekend and I used some of the new March products from Our Daily Bread Designs to make a card and a gift bag. Creative Nugget: The Card Caddy and Gift Bag Dies and Gift Bag Handles and Topper Dies make creating this little gift bag easy and will be perfect for tucking away a few little gift items. 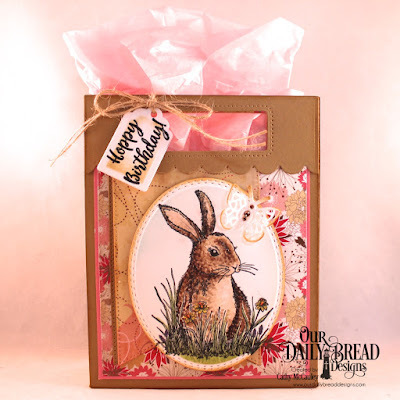 The papers are from the Beautiful Blooms Paper Pad and the cute bunny is from the Hoppy Birthday stamp set. Other dies used include the Large Banners Dies, Pierced Rectangle Dies, Oval Stitched Rows Dies, Bitty Butterflies Dies, and the Tags Trio Dies. The card was created with some of the new monogram letters. 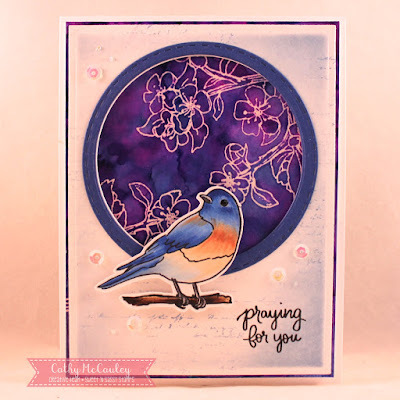 Creative Nugget: What...no stamping? This card was made with all dies and a little stitching! Papers from the Easter Card Collection 2016 were used and the dies used include The Letter C, the Letter M, Fancy Circles, Double Stitched Circles, and Circles Dies, the Lattice Background Die, the Pierced Rectangles Dies, and the Bitty Butterflies Dies. 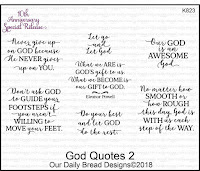 For more inspiration using the March 2018 release, hop on over to the Our Daily Bread Designs Blog. Hello friends! Happy Spring...but you would not know it by the weather as we have just had the biggest snow storm of the year...more time for tea and stamping! Today is Throwback Thursday over at Our Daily Bread Designs and the featured stamp set is Apples. What a pleasure it was grabbing this wonderful stamp set off the shelf. Creative Nugget: Yum...don't those apples look delicious! The bucket of apples from the Apples stamp set was colored with Copic Markers. Paper from the Follow the Son Paper Pad was used for the layers. ODBD Custom Dies used to create this card include the Pierced Rectangles, Pierced Circles, the new Fancy Circles, Circles, and the Trellis Strip. 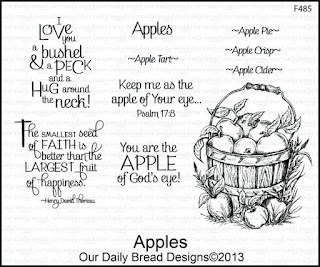 To see more samples using the Apples stamp set head on over to the Our Daily Bread Designs Blog. Thanks so much for stopping by! If it's snowy where you are...stay warm and safe! Hello sweet friends! 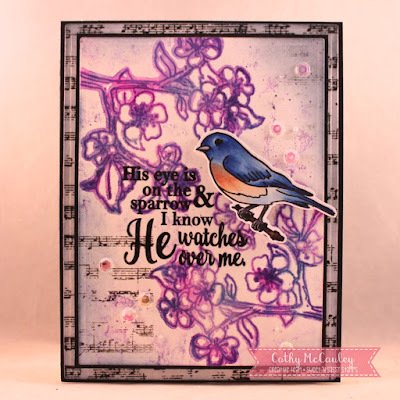 Yesterday I shared two cards over at the Sweet 'n Sassy Stamps Blog using the Alcohol Faux Bleach Technique and the new Birds & Blooms stamp set from Sweet 'n Sassy Stamps and thought I would share here as well. This is a fun technique and the bonus is...you end up with two great backgrounds instead of just one! Creative Nugget: Begin by embossing your image on a piece of glossy card stock with clear embossing powder. Using a felt application tool, dab on a variety of alcohol inks or Copic Refill inks and blending solution or rubbing alcohol to make the inks move. Play around with the inks until you get the desired results. Place the panel on a paper towel on an ironing board and cover with another piece of regular card stock. Iron off the embossing using heat with no steam. The image will transfer onto the second piece of card stock and leave a bleached look on the first. And there you have it....two wonderful backgrounds! To see a video tutorial on this technique at Splitcoaststampers, click HERE. Now all you need to do is finish off your cards...include some sequins for a bit of bling and there you have it! 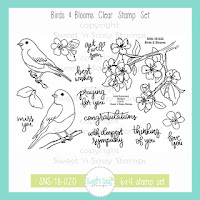 Birds & Blooms, Texture Tiles 1, and Timeless Hymns were the sets used to create these two cards and they are all from the March Release and are now available at the Sweet 'n Sassy Stamps Store! Thanks so much for stopping by! I hope you were inspired to give this fun technique a try! Have a blessed day! Hello friends! 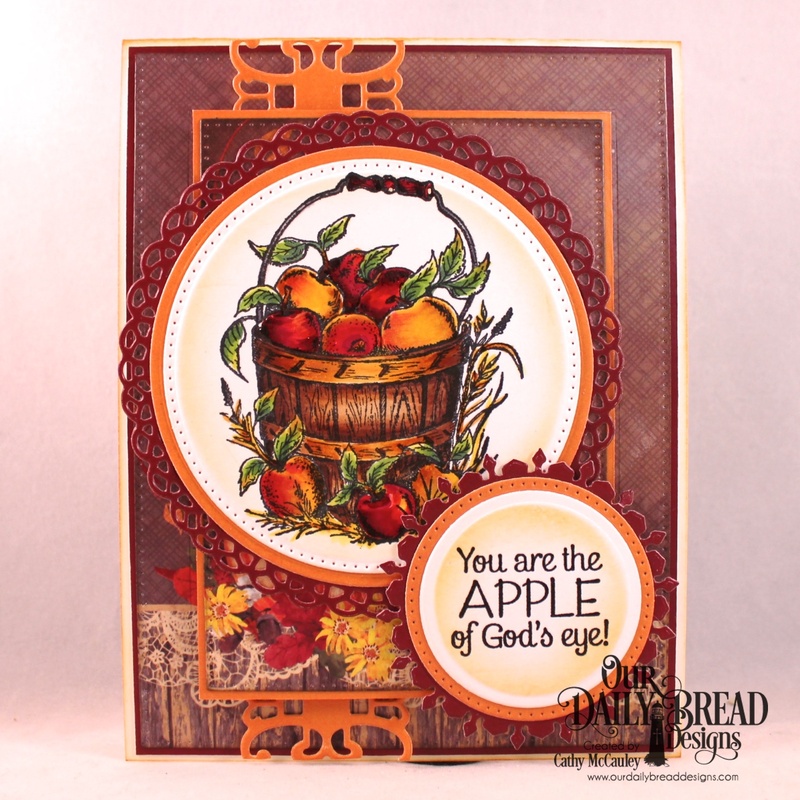 Can you believe we are actually celebrating the Our Daily Bread Designs' tenth year! My how time flies. I have had the joy of designing for this wonderful company for the past five of those years and what a wonderful group of ladies I have had the pleasure of meeting during that time. 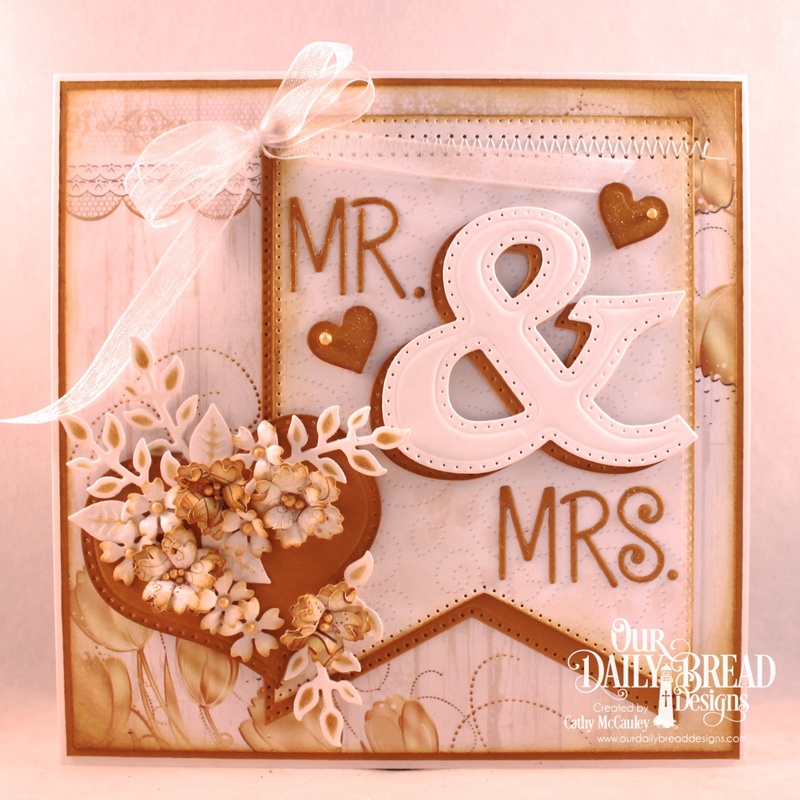 As always, ODBD is releasing two fabulous new stamp sets and two beautiful new die sets to celebrate the occasion. I have four cards to share using the new products. 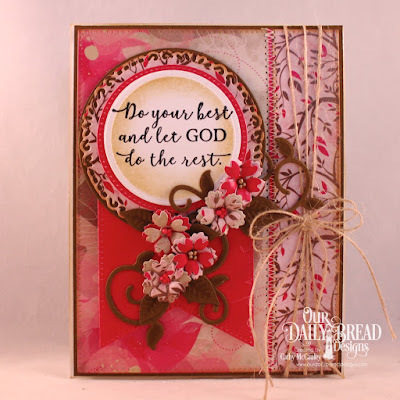 Creative Nugget: The God Quotes 2 stamp set was used on this card with a stitched split panel of pretty papers from the Beautiful Blooms Paper Pad. 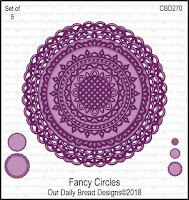 The new Fancy Circles Dies were used along with Pierced Rectangle Dies, Pierced Circles and Circles Dies, Large Banner Dies, Bitty Blossoms Dies, and Fancy Foliage Dies. Prills were added to the middle of the blossoms and jute twine ties everything together. Creative Nugget: This second card also uses the God Quotes 2 stamp set. Papers from the Beautiful Blooms Paper Pad were layered with cream, tan, and pink card stocks all cut with the new Filigree Circles Dies. 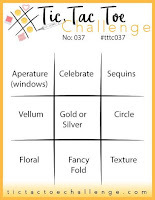 Other dies used to complete the card include Pierced Rectangles Dies, Pierced Circles and Circles Dies, Flower Lattice Die, and the Bitty Butterflies Die. 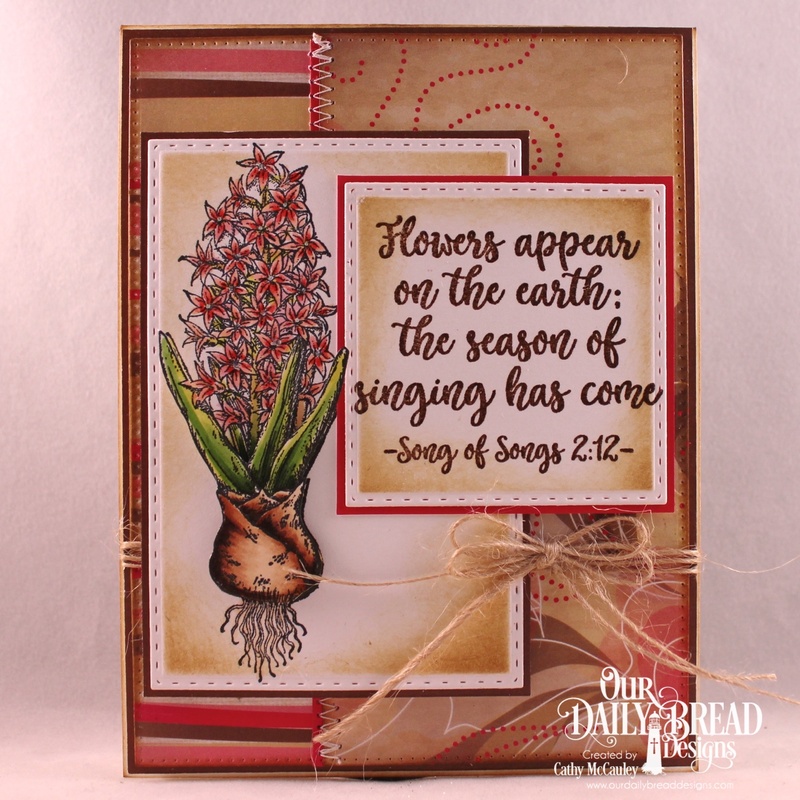 Creative Nugget: The third card was made with the new God Verses 2 stamp set and layers of papers from the Blooming Garden Paper Collection. The dies used include the new Fancy Circles Dies, Pierced Rectangles Dies, Pierced Circles and Circles Dies, and the Flower Lattice Die. Organdy ribbon was threaded through the Flower Lattice Die and a bow added. 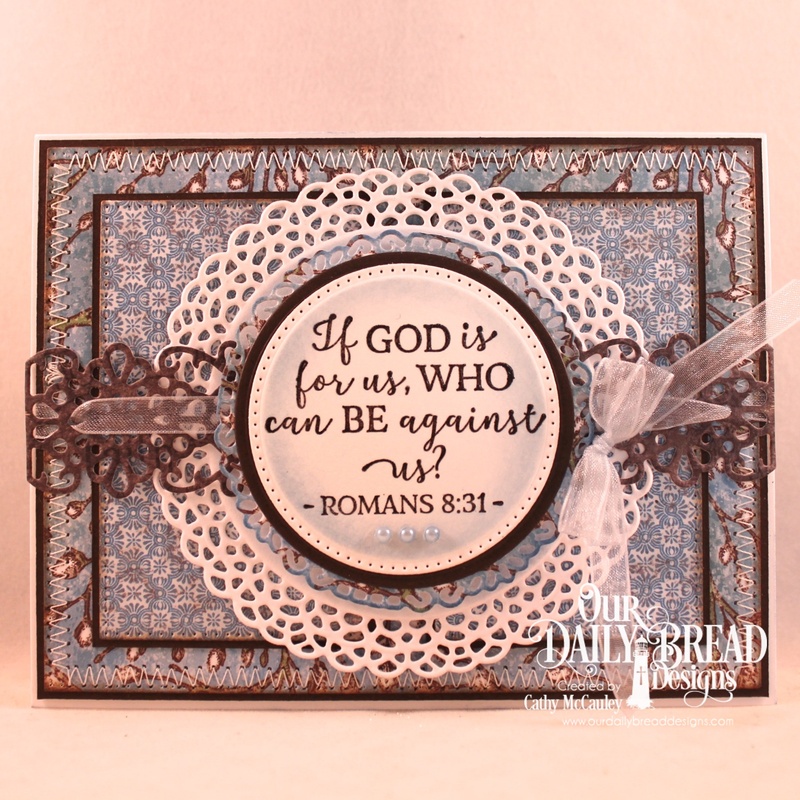 Creative Nugget: My final card also uses a verse from the God Verses 2 stamp set. Papers from the Chalkboard Paper Collection were cut with dies to look like a piano. The dies used include the new Fancy Circles Dies along with Pierced Rectangles Dies, Leafy Edged Borders Dies, and the Small Bow Dies. 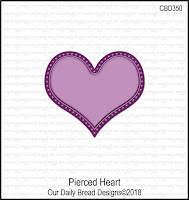 Our Daily Bread Designs Store. 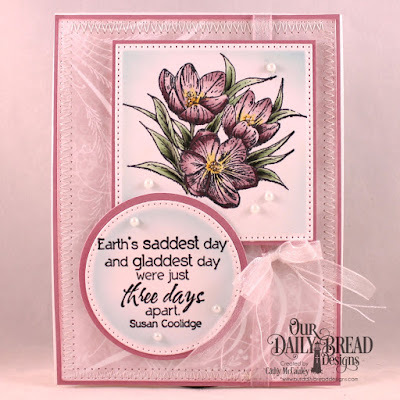 Thanks so much for stopping by...pop on over to the Our Daily Designs Blog to see more beautiful creations made with the products from the ODBD 10th Anniversary Release! Good morning, friends! Today we are taking another look at the ODBD March 2018 Release. I have two cards to share with you using some of the new products. 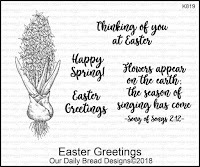 My first card was made with the Easter Greetings stamp set. 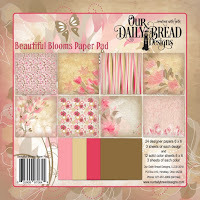 Creative Nugget: The paper behind the Lattice Background die cut is from the Beautiful Blooms Paper Pad. A frame was made with Pierced Rectangles Dies. 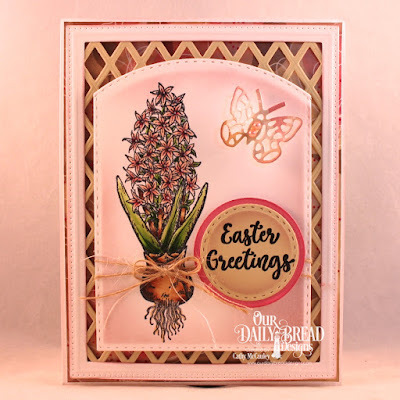 The panel with the copic colored hyacinth from the Easter Greetings set was made with a Double Stitched Rectangle Die and a Stitched Ovals dies. Double Stitched Circle and Circle dies were used to cut the embossed sentiment. A Bitty Butterflies Die was use to create an accent for the card. Some jute twine ties everything together. 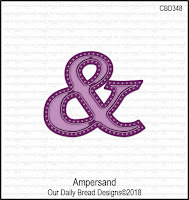 The new Ampersand and Pierced Heart dies were used to create a wedding card. Creative Nugget: What? No stamping on this card...all dies! The papers used for both panels on the card are from the Wedding Wishes Paper Pad. ODBD Custom Dies used include Large Banners, Ampersand, Alphabet, Pierced Heart, Layering Hearts, Bitty Blossoms, and Fancy Foliage. Hello friends! Today Our Daily Bread Designs is taking the time to honor Lisa Somerville for all the hard work she does behind the scenes. Lisa works tirelessly to coordinate the design team, promote ODBD on social media, organize new products and sales, and work the shows. 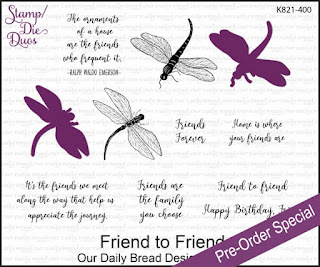 Our Daily Bread Designs has a birthday surprise just for you, Lisa...a new stamp set full of sentiments submitted by you over the years...Friend to Friend Stamp/Die Duo! We hope you enjoy the cards we have created just for you! Created Nugget: The Scalloped Chain Die was popped over a piece of paper from the Blooming Garden Collection. 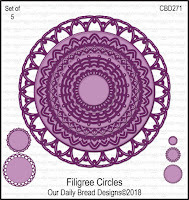 Several Filigree Circle die cuts were stacked together and covered with several layers of white embossing powder. Die inks were directly dabbed onto the circle and more white embossing powder added. 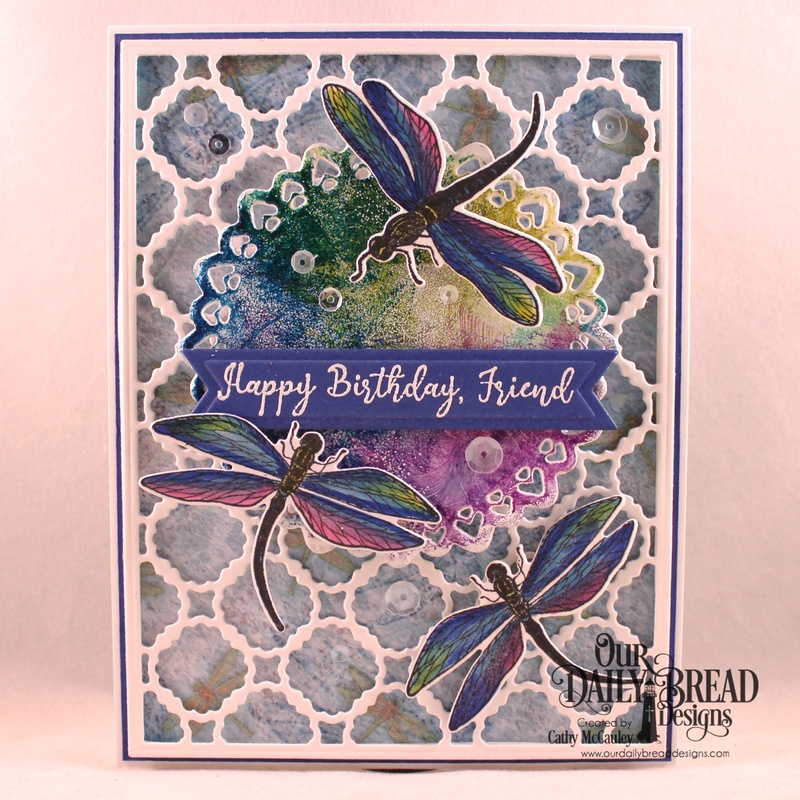 The dragonflies were colored with Copic Markers and cut with the coordinating dies. Finally, the sentiment was white embossed on blue card stock and cut with a Pennant Flag Die. Creative Nugget: The dragonflies were white embossed randomly on a piece of mixed media paper. Watered down Oxide Inks were dabbed onto the panel. 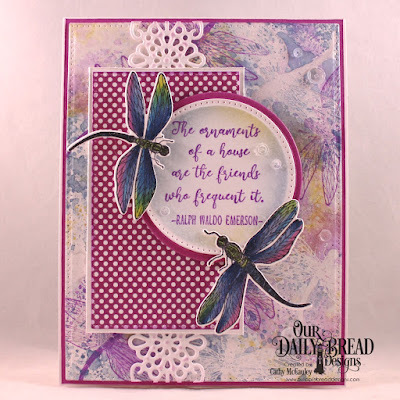 The embossing was ironed off and more dragonflies were stamped in purple ink to create the background. A panel of paper from the Plum Pizzazz Paper Pad was added. 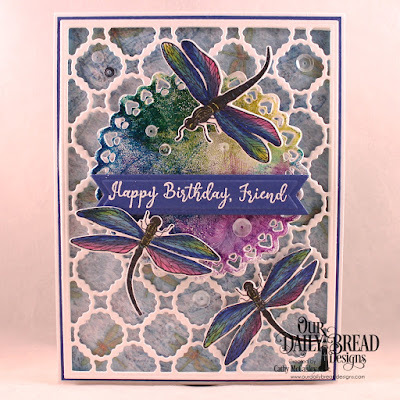 The dragonflies were again stamped, colored with Copic Markers, cut with the dies and popped onto the card. Other ODBD Custom Dies Used include the Pierced Rectangles Dies, Pierced Circles Dies, Circle Dies, and the Flower Lattice Die. 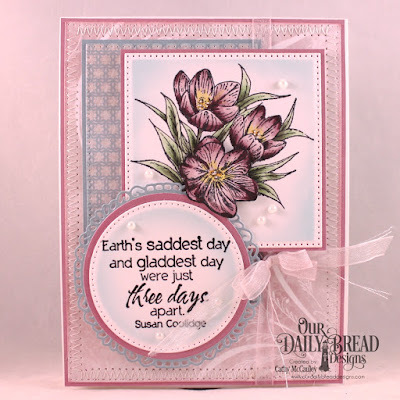 To see more beautiful creations made with the Friend to Friend Stamp/Die Duo AND to see how five lucky people will have an opportunity to win this set for FREE, hop on over to the Our Daily Bread Designs Blog! Hello sweet friends! My card today was inspired by one of those wonderful old hymns of the faith. 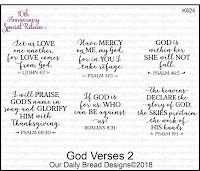 Sweet 'n Sassy Stamps just released a whole new stamp set filled with these classics...Timeless Hymns, perfect for sending a message that uplifts and encourages! 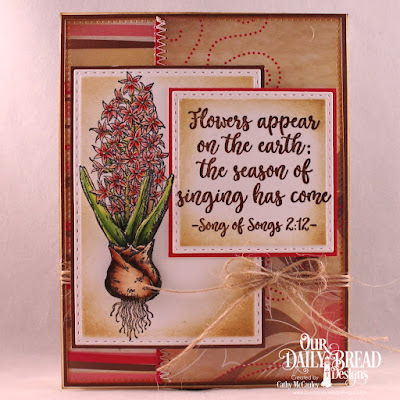 Creative Nugget: The hymn was embossed in the middle of a square panel cut with a Spellbinders die and a circle was lightly penciled in around the hymn. Using my Misti and the blossoms from the Birds & Blossoms stamp set, a frame was stamped around the sentiment and colored with Copic Markers. A stitched circle die was then dry embossed around the hymn and some extra blossoms were cut out to pop into the empty spaces. 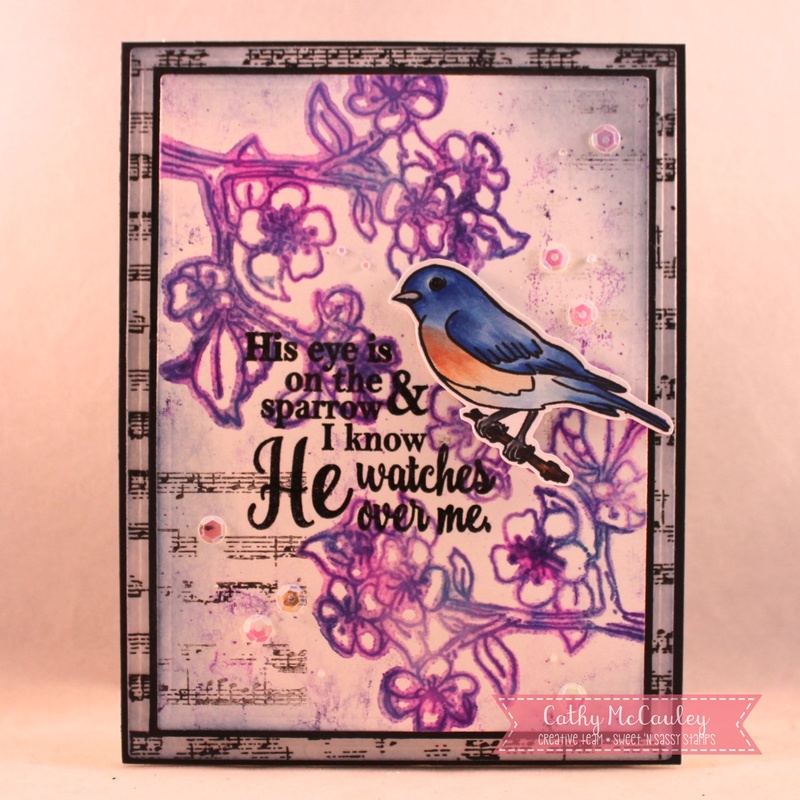 The sentiment from the Be Encouraged 2 stamp set was embossed onto a mixed media panel dabbed in watered down Oxide Inks. A bow and some sequins were added to finish the card. 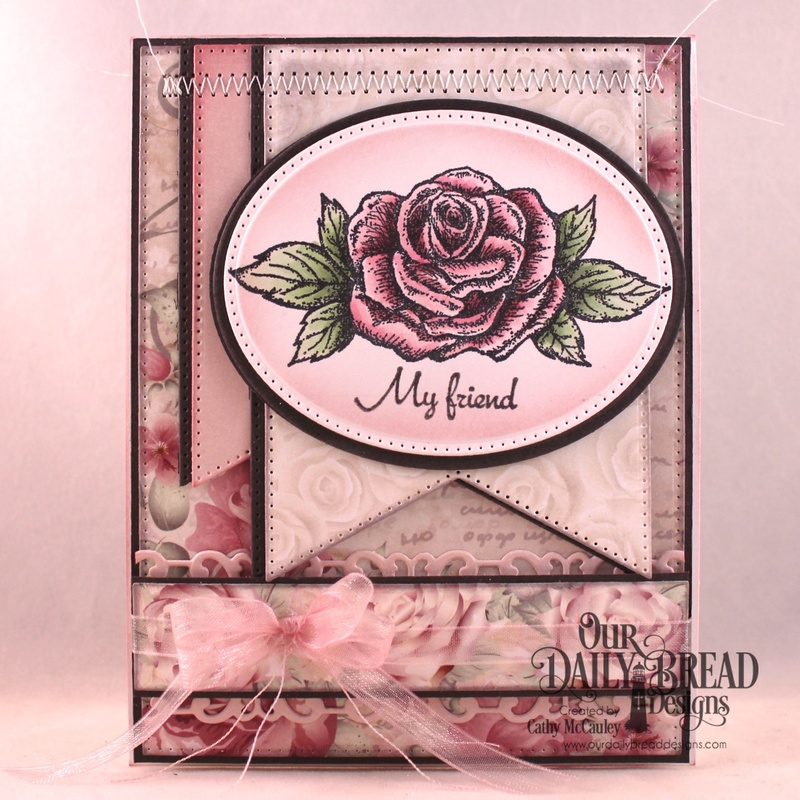 Creative Nugget: The Romantic Roses Paper Pad is a perfect match for this stamp set and is what was used for all of the layered panels. The pretty rose image from the My Friend stamp set was colored with Copic Markers. The new Large Banner Dies were used to cut the banners which were stitched to the card. 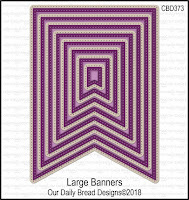 Other dies from the Our Daily BreadDesigns Store used include Pierced Rectangle Dies, Pierced Oval and Oval Dies, Trellis Strip Die, and a Center Step A2 Layers Die. A dyed organdy bow was added to finish the card. I love layering different shapes and papers! 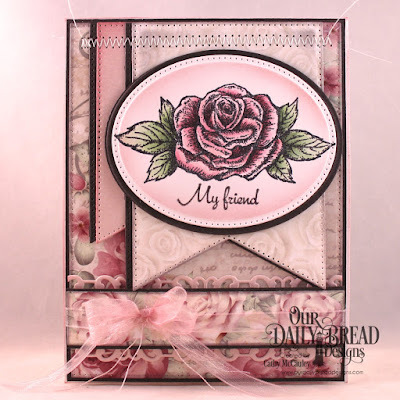 To see more samples using the My Friend stamp set head on over to the Our Daily Bread Designs Blog. As You Like It Challenge - Single or Multiple Layers? Thanks so much for stopping by...remember to stop and smell the roses! Hello friends! 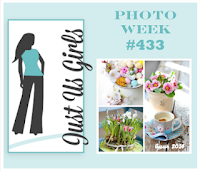 Today I am sharing over on the Sweet 'n Sassy Stamps Blog and thought I'd share here as well. Two stamp sets from the March Release were used to make my card...Birds & Blooms and Texture Tiles 1. Creative Nugget: The base background was made with the grid from the Texture Tiles 1 stamp set stamped in three different colors of distress ink and then sponged using the same three colors...Worn Lipstick, Broken China, and Scattered Straw. The script tile was embossed in white and sponged for the bottom panel. An oval window was cut from a white piece of Solar Crest card stock and framed with Smokey Shadow. The mixed media panel showing through the frame was sponged with the same three colors of Distress ink, spritzed with water, and overstamped with the script tile. 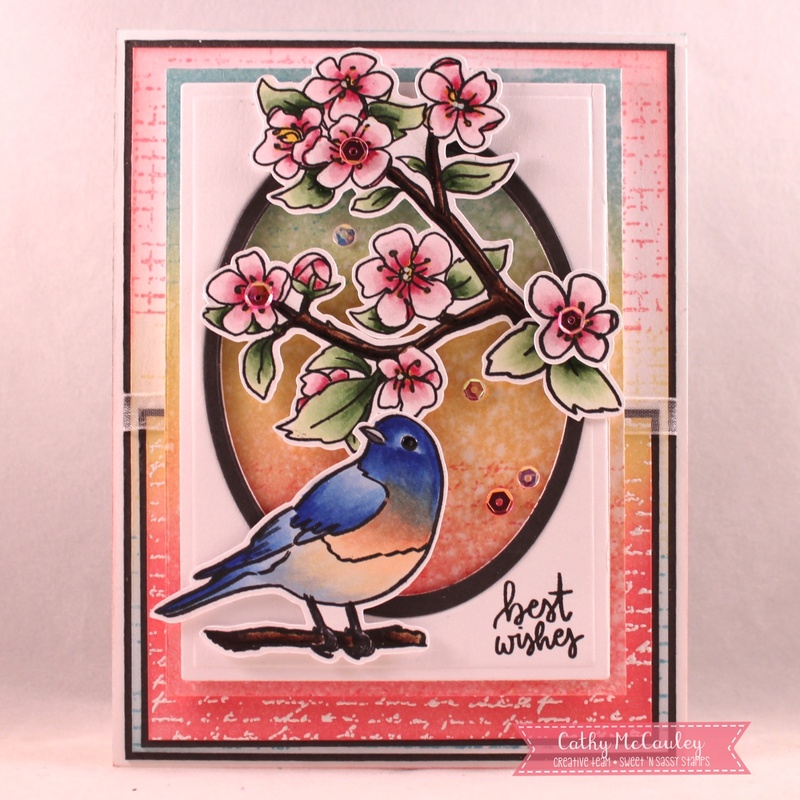 Copic Markers were used to color the images from the Birds & Blooms stamp set and my trusty ScanNCut was used to cut out the images. These were popped onto the card with foam tape, the sentiment clear embossed in the corner, and sequins added to finish the card. Good morning, friends! 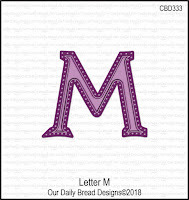 Easter, Spring, Monogram Letters, and beautiful papers are being featured on today's Our Daily Bread Designs March 2018 Release. My first sample uses the new Hoppy Birthday stamp set. Creative Nugget: The cute bunny from the Hoppy Birthday stamp set was Copic colored on a panel cut with a Pierced Squares die. The sentiment was embossed on a Pierced Circles die cut and clouds were sponged on the background. A layer of paper from the new Beautiful Blooms Paper Pad was cut with a Leafy Edged Border Die. A Bitty Border and Mini Bow were added to finish the card. 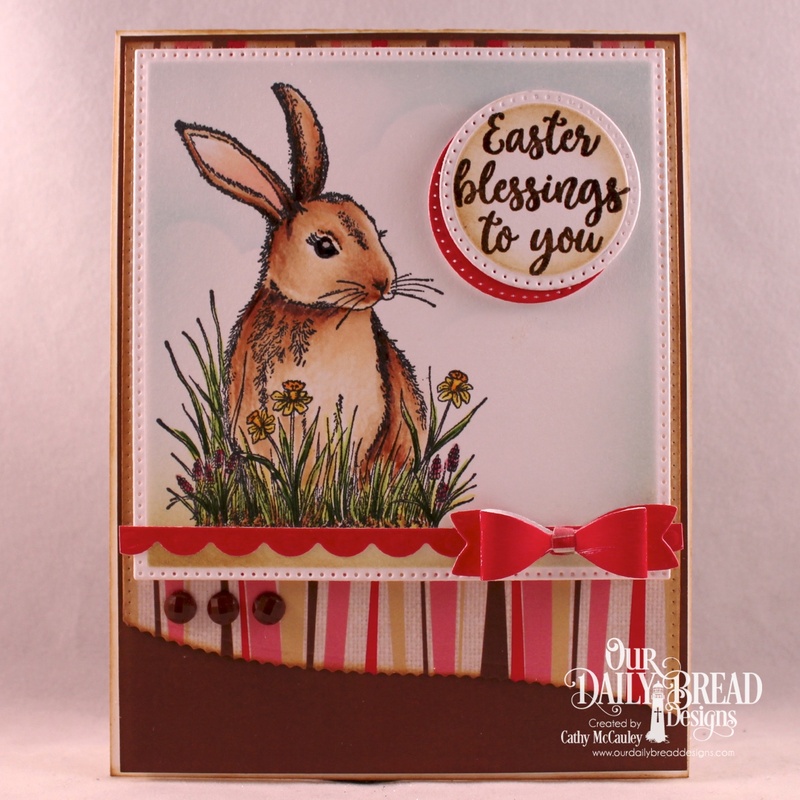 My second sample was made with the Easter Greetings stamp set. 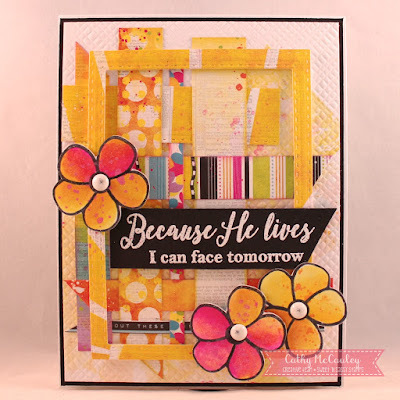 Creative Nugget: The front of the card was created by stitching papers from the Beautiful Blooms Paper Pad together and the panel cut with a Pierced Rectangle Die. 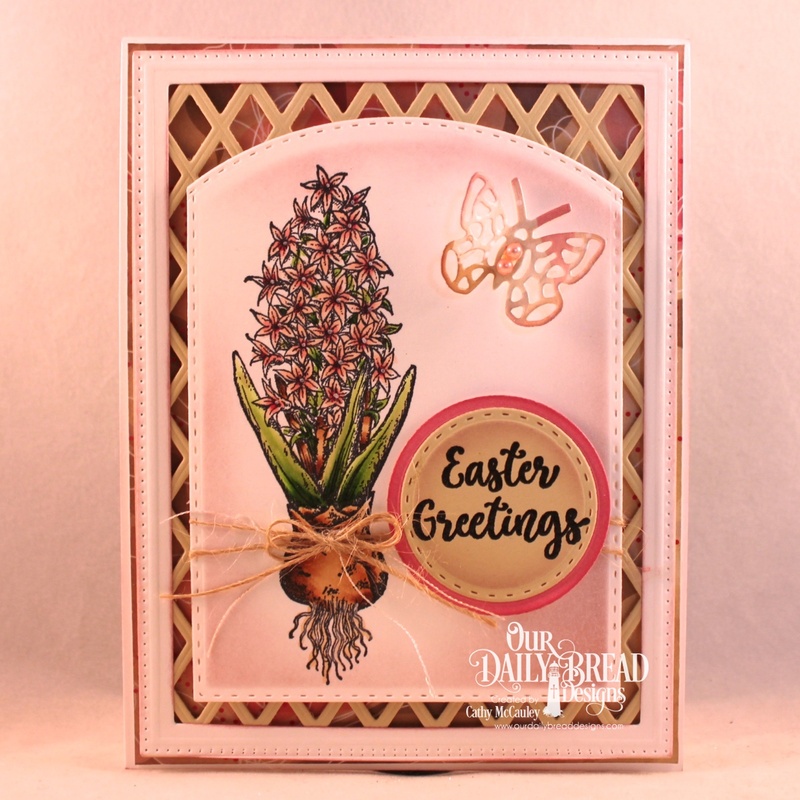 The Hyacinth from the Easter Greetings stamp set was colored with copic Markers and the panel cut with a Double Stitched Rectangle Die. 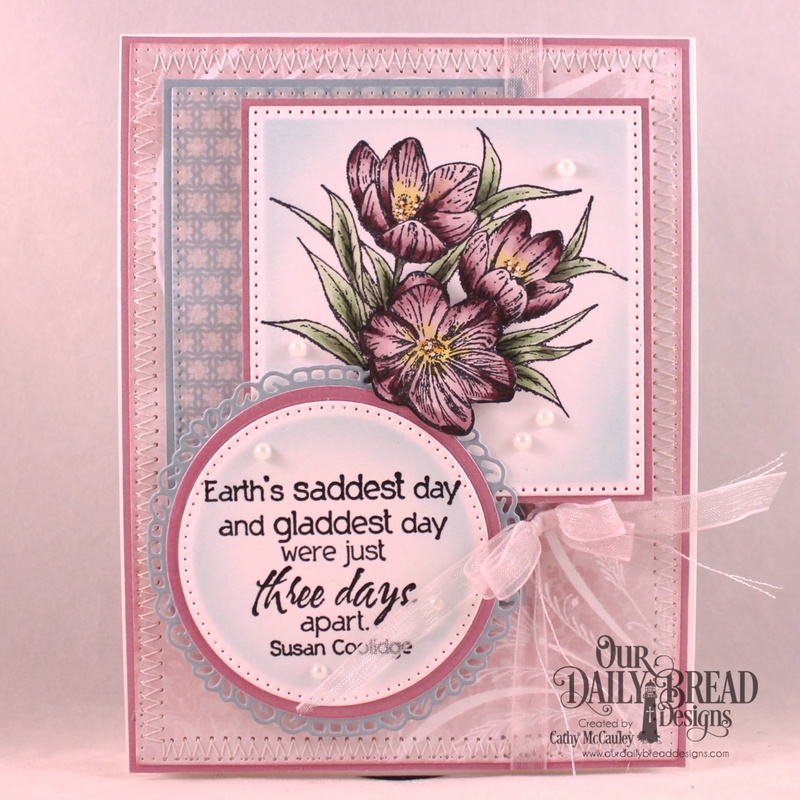 The sentiment was embossed on a panel cut with a Double Stitched Square Die. The bulb of the hyacinth was stamped, colored again, fussy cut and popped onto the card for some dimension. Some twine ties everything together and finishes off the card. Creative Nugget: White card stock and papers from the Beautiful Blooms Paper Pad were layered for the card front. The layers were cut with a combination of dies...Pierced Rectangles, Double Stitched Rectangles, Lavish Layers, Pierced Circle, and even the insert from The Giving Gift Box Dies. 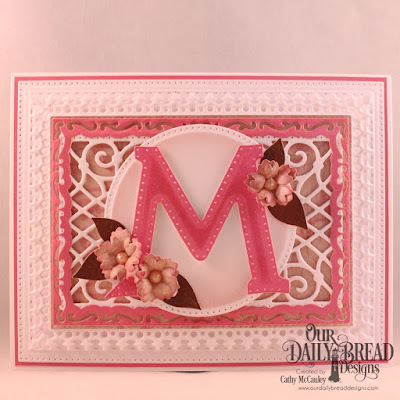 The Letter M was popped onto the circle and Bitty Blossoms Dies were used to add some flowers to the card. 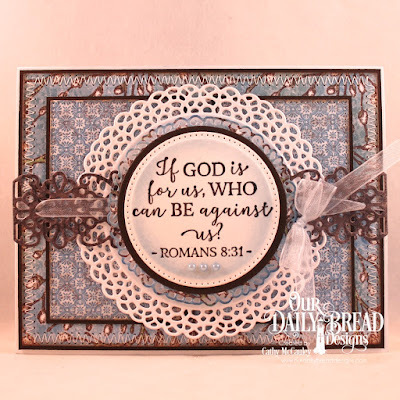 Be sure to check out the Our Daily Bread Designs Blog, Facebook Page, and Instagram to see more beautiful samples created by the Breadbasket Designers using products from the February release.